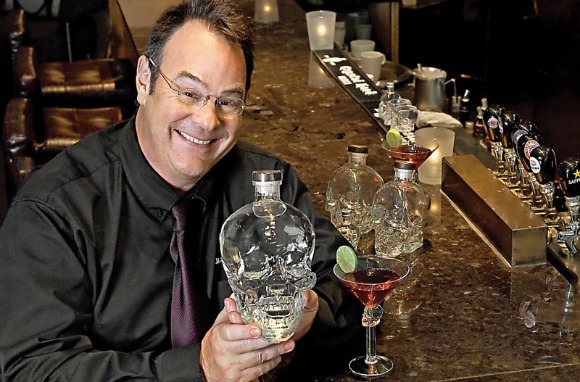 Actor, musician, writer and now distiller Dan Aykroyd will be visiting Norwalk, Connecticut on Saturday, April 6th 2013. Total Wine & More will host Dan Aykroyd for a bottle signing from 1:00 p.m. – 3:00 p.m.
Aykroyd, known for his work on Saturday Night Live and in films including Trading Places, Ghostbusters and Driving Miss Daisy, has been involved with producing and distributing wine and spirits for more than seven years. He recently created Crystal Head Vodka (view hilarious promo here) as a result of his fascination with the supernatural. The super-premium vodka is made with water from a deep aquifer in Newfoundland, Canada, blended with selected grains for a creamy and slightly sweet finish, and triple crystal filtered through Herkimer diamonds, which, according to New Age belief systems, embody positive energy and goodwill. Crystal Head Vodka is available wherever fine wine and spirits are sold.